India, Biography of Yves Lanthier. 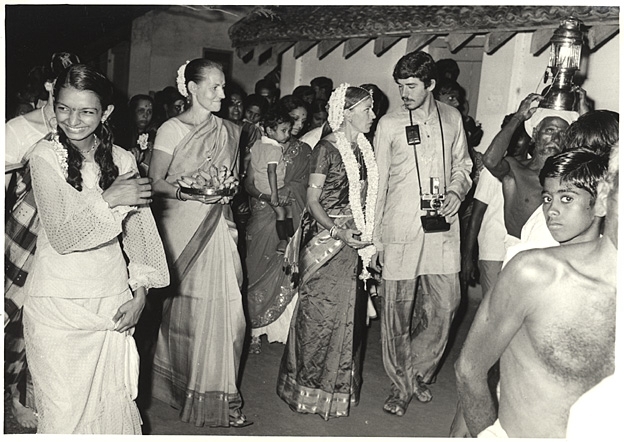 Click here for the latest: "Press article"
Attending his aunt weeding in Tamil Nadu. Trompe l'oeil literally translates from French to mean "fools the eye." One of the most difficult of all artistic effects to achieve, trompe l'oeil demands a meticulous attention to detail by the artist. Nuances of light, gradations of color and correct sizing must be skillfully incorporated so as to make the two-dimensional work seem to be three-dimensional. The journey that led Yves Lanthier to become a master of this style of painting began in St. Jerome, Quebec and continued with his travels to India and the Himalayas in the early 1970's, through Munich, Amsterdam, Paris and Italy, before returning to North America in the 1980's. This vagabond existence helped to shape the artist he has become today. "Everywhere I went, I saw the world as a painter would see it," Yves explains in his soft, French-accented English. As he traveled and each new scene unfolded, he would meditate about how he would transfer that vision to canvas- how colors would be mixed, or the lights and shadows would fall or lines of perspective be placed to bring those visions alive again. Yves is a completely self-taught artist, who discovered his gift at a very young age. "It all started in the first grade," he says. During a drawing class, an assignment was given to sketch a person that the students liked. "Without any thought, I moved to the front of the class and started drawing my teacher, portrait style (I must admit I had a little boy crush on her, so this seemed natural!). I was so involved, and when I woke out of my trance, to my surprise almost the entire class was surrounding me, admiring my sketch." Throughout his school years, Yves continued to draw and experiment with painting techniques, poring over illustrated books and studying the works and individual styles of the great Renaissance masters late into the night. "Sometimes I almost felt as if the masters themselves were there, teaching and guiding me. I foresaw myself, through the stages of my life, traveling to different parts of the world- living free and fulfilling my deepest desires and passions." By day, exhausted, he would often sleep through his classes, though he maintained top grades. When he was 17, his parents, sensing his lack of interest in more traditional careers, sent him to India to visit his aunt, a missionary in the Tamil Nadu district. The experience moved him deeply. "I was introduced to Yoga, which I still practice to this day, and I was taught to play the bamboo flute by Indian musicians," he recalls. In Venares, he attended an annual music festival which was held in large temples and ancient buildings, creating a magical surrounding for the event. "Everyone was sitting on the floor, with musicians on a center stage raging through the night with their instruments. I could not believe the marvelous and enchanted music, this incredible hidden talent appearing right before me. The energy and strong emotion, the constant change of rhythm in an intricate composition, would keep everyone awake and alert through the night, as the full moon and the lanterns revealed strong shadows of the carved stone details, statues and columns." That first enthralling trip lasted for a year. After a short-lived return to Canada, he ventured abroad once more, traveling through Paris, Amsterdam and Europe before returning to India and the Himalayas where he stayed for most of the next fifteen years. In addition to French and English, Lanthier learned to speak Hindi, Urdu, a bit of Sanskrit, and Tibetan. Hiking through the mountains, carrying a little flute that he would play sometimes, he would come upon remote villages, some rarely if ever visited by outsiders. At 6'4", towering over the people living there but speaking their language, he would be greeted and revered as a holy man or even as a god. The villagers would welcome him into their homes and he became their link to news of the outside world. Eventually, he discovered a place called "Manaly", or "Valley of God". It was beautiful with fruit trees that the British had planted nearly a century before. "Here the earth was so rich, the water so pure and the local fruits and vegetables so unbelievable, I felt as if I had never tasted real food before." Yves rented a large house and, to earn a little money, took in European and American tourists as paying guests, leading them on expeditions into the mountains. He also sketched and continued to study art. In those days, traditional painting supplies were hard to come by, so he worked with what he had, thinning the oil paints with motor oil instead of the usual linseed. "I only have a few of those paintings in my possession now, but those have darkened considerably over the years," he says with a laugh. In the early 1980's, Lanthier left India, determined to pursue his dream of becoming an artist. He followed one of the ancient trade routes from the Middle East to Europe, traveling through Afghanistan, Iran and Turkey, then Greece, where he stayed for a few months, painting the vibrant Mediterranean village scenes. After a brief sojourn in Europe, he made his way back to Canada. At the time, his mother, a professional caterer and business woman, was opening a disco. "This is where I painted my first mural," Yves describes. It was a woman's face, with her hair running along the back walls- "a bit visionary and modern, but a mural nonetheless!" After that, used to the warmer climates of south Asia, Yves decided to follow his sister and brother to Florida. "I started a little painting business," he says. "I would wake up around 4 o'clock in the morning, work on my own painting until eight or nine, then go to work painting the insides of apartments." One day he answered a newspaper ad and was hired by a group of French artists working on a Palm Beach mansion. Initially he worked on areas already started by the other artists, but soon he was assigned to create new designs. He worked on that project for a year, painting trompe l'oeil doors and ceiling designs, and embellishing architectural elements of the home with intricate details. He also learned that for an artist to be successful commercially, it was important to be able to work with speed, choosing larger brushes and laying in the details quickly. Later, a lucky encounter at the local library with an architect who was developing several large homes in Boca Raton led to more commissions to create trompe l'oeil domes, rotundas and murals. Each project took a minimum of four to six weeks to complete, while the biggest dome took six months. In 1998, he was hired to create exquisite trellis work, faux stone and trompe l'oeil scenes for Celine Dion's new Jupiter Island estate. His murals began to adorn the East Coast mansions and estates of the super-wealthy, as well as the interiors of large yachts. As Yves completed designs and built his portfolio, he kept meticulous photographic records of his work. "I always had it in mind to do a book when I had enough material," he explains. In 2003, he pitched the idea to North Light Books, a prestigious publisher of art and art instruction books. The editors were intrigued and promptly gave Lanthier a contract. "The Art of Trompe L'Oeil Murals" was published in December of 2004 to critical acclaim (it has a five-star rating on Amazon.com). A lovely, full color "coffee-table sized" book, it showcases some of Lanthier's best work and includes step-by step demonstrations to help the aspiring artist learn a few of the techniques that Lanthier has developed. "The hardest part for an artist is sometimes just to begin," Lanthier says. "taking the dirty tubes, spreading out the materials...but then the inspiration starts- like a song, it flows by itself- and then you come up with something unique!" Besides the classical realism of trompe l'oeil, Yves has worked in the surrealistic style for some years, covering large canvases with mystical scenes inspired by his world travels. These paintings often incorporate fantastical and mysterious characters on desert landscapes against vivid cerulean blue skies. Lanthier will not give an explanation of these paintings to the observer. "I feel it was from my time in India that I gained many of the ideas I have now. I believe I have something to say. It is up to the viewer to decide what it means." In the 1990's Yves began experimenting with Corel Draw as a new medium, ultimately winning awards for some of the art that he created with this computer program. He dismisses the idea that computer generated art is not "real" art, noting that the artist works with an electronic tablet and pen, transferring colors on the screen. "It is just another tool," he points out, "like Jimi Hendrix's guitar." Asked if there are any other mediums that he would yet like to experiment with, Lanthier laughs. "If you gave me a studio with all the tools, I'd probably hammer some stuff!" Most recently, Yves has begun teaching trompe l'oeil seminars in North America and in Europe. During intensive, five day workshops, beginning and experienced artists complete an actual trompe l'oeil painting on canvas, learning the secret techniques of the master muralist that Lanthier has developed. He is eager to pass on the knowledge he has acquired. "I think it is important to leave some type of legacy to the upcoming generation- that is becoming more and more rare," he emphasizes. Over the next year, workshops, which include all the materials needed to finish the painting, are being held in the Baltimore area, Mount Dora, Florida, Paris and Italy (more information can be found at www.yvesart.com- click on "seminars"). In 2004, in search of a more peaceful existence, Lanthier moved from South Florida to Lake County, purchasing a lakefront home in Umatilla, where he lives half the year, returning to Canada every summer. He paints as the mood strikes him, with periods of intense creative activity which he describes as "just going with the flow...like falling in love." Currently, his work is sold online through his website, www.yvesart.com. Art lovers can commission custom trompe l'oeil murals, purchase original paintings, or choose any of Yves' designs and have them printed to size on canvas (the giclee process of color transfer and reproduction makes owning a "painting" affordable for all). The canvas can be hung as art, or combined with architectural elements in the home, mimicing the look of an authentic, handpainted mural. What does the future hold for this gentle and soft-spoken artist? "I am still developing as an artist and making a name for myself," he affirms. "Greatness comes with compassion, and an understanding of the unknown." He would like to work on several more books that would incorporate his art with his travel memoirs and the spiritual insights that he has gained through his experiences. "And then I would like to travel again," he says "back to India...South America....Europe....it is all inspirational for my art!"